^ 1.0 1.1 Fahrenheit temperature scale. Sizes, Inc. 2006-12-12 [2008-05-09]. ^ Heath, Jonathan. 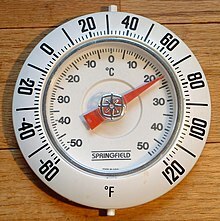 Why does the Fahrenheit scale use 32 degrees as a freezing point?. PhysLink. [2008-05-09]. ^ Elert, Glenn. Temperature of a Healthy Human (Body Temperature). Scandinavian Journal of Caring Sciences. 2002, 16: 122 . doi:10.1046/j.1471-6712.2002.00069.x. （原始内容存档于2010-09-26）.